Upon its release MAMEM video created a lot of traction towards our project. As an example it has been featured in Biotech.Asia, appearing in its news feed. Biotechin.Asia is a Singapore-based biotech and healthcare news website. It is focused on delivering simplified, curated, fact-based news for all stakeholders in the biotech and healthcare ecosystem. As a virtual newsroom, Biotechin.Asia covers the latest in research/news/insights from around the world while putting a spotlight on developments in Asia. It aims to nurture and bring together an ecosystem of biotech and healthcare startups, academicians and industry onto a common platform. 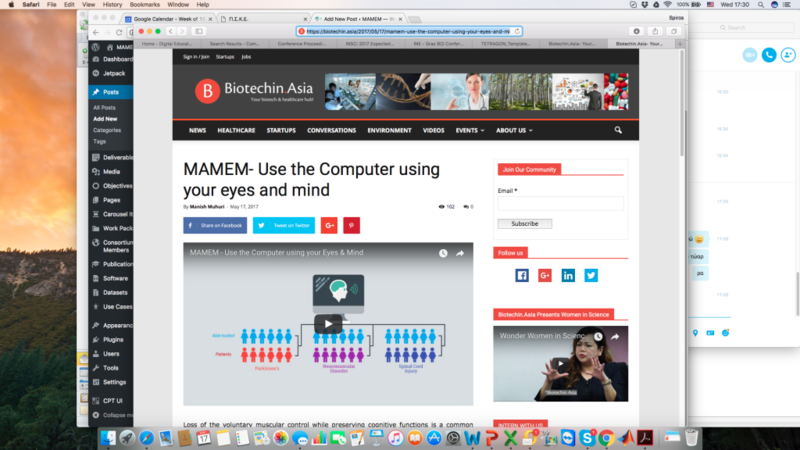 PreviouslyCheck our video explaining what we have been doing in MAMEM! Read NextMAMEM joins the Global Accessibility Awareness Day. Check our video!